-Choose your location for Protests on January 22-23, 2015. -Share your event plans with us on the National Event page. -If you are planning to be in D.C. for the March For Life…stay tuned for protest details. -Let’s start protesting today and everyday leading up to a national strike…and protests on Thursday and Friday January 22nd and 23rd, 2015. 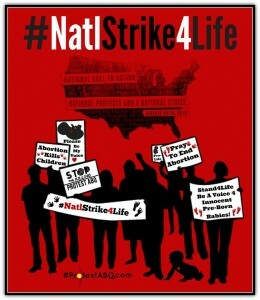 Albuquerque, NM- Protest ABQ is joined by national Pro-Life organizations, including Operation Rescue, Created Equal and Survivors of the Abortion Holocaust in declaring the first ever national pro-life call to action: a National Strike and Protests on January 22-23, 2015. America has endured 41 years of legalized abortion, now is the time to stand together in solidarity as a people of conscience to end the killing of children in the womb, says Fr. Stephen Imbarrato, founder of Protest ABQ in Albuquerque, New Mexico. The use of strikes in various venues have been and continue to be effective in producing change. This one-of-a-kind call for two days of national strike and protests has the potential of sending a resounding message to the leaders of this nation that the American people want abortion to end. The yearly anniversary of Roe vs. Wade continues to be a day of mourning across the pro-life community. Each year thousands gather in Washington D.C. to protest against this evil. 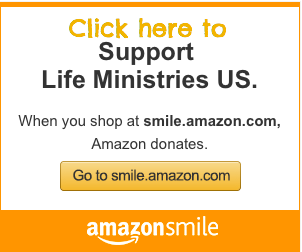 However, to step up our call to end abortion, we are encouraging all like-minded people throughout the country not to go to work or school nor spend money on Thursday, January 22nd and Friday, January 23rd, 2015, but instead to join together for prayer, fasting and PROTEST in their localities. All participants must commit to following the model of Dr. Martin Luther King, Jr. in their protests. “Even if we were to be beaten, screamed at, or abused, we will not respond in kind,” stated Fr. Imbarrato. Protests will be held in front of state capitol buildings, busy intersections, and abortion facilities. No place is off limits and no one who profits from, supports, or condones pre-born child killing is immune from these protests. Together, we are calling on national religious and pro-life leaders to join us and encourage all like-minded people to participate in a national strike. We will not condone violence of any kind by anyone in this National Strike. Indeed, we are protesting the use of violence — against children in the womb. We will peacefully and prayerfully protest this violence. 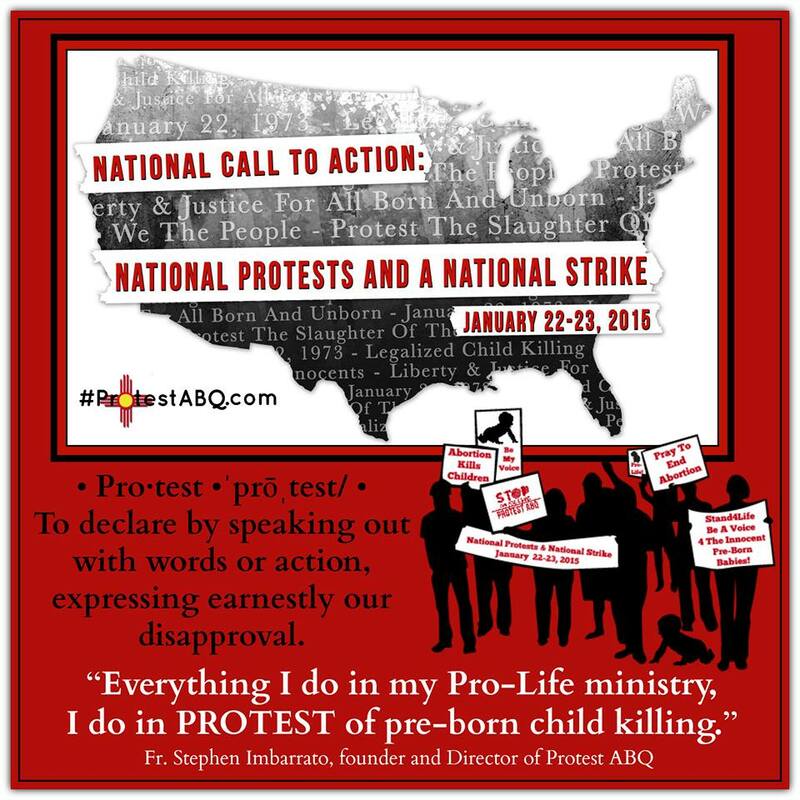 In the coming weeks and months leading up to January 22-23, 2015 Protest ABQ will be calling on all Pro-Life groups to commit to joining this historic effort.